Semantics and Free Web Poetry at GentleJunk co. In the concept of Free Web Poetry ‘Free’ refers to freedom of expression (freedom for nonlinear expression and intuitive creation), ‘Web’ refers to online but also web-like structure, and ‘Poetry’ is from the Greek “ποίησις“, poiesis, a ‘making’ or ‘creating’. FWP could be intriguing for writers and artists who like to make complex nonlinear structures. 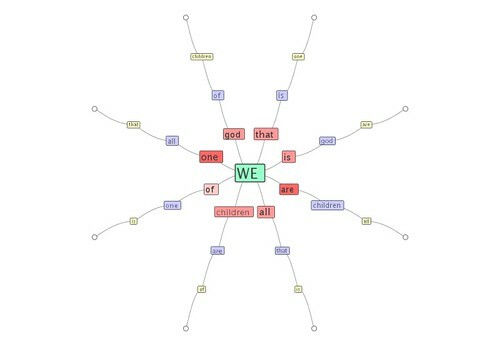 I use it for making interactive cut-up / haiku poems – poems change as reader clicks on the nodes. How to use: download and install xebece (software developed by Roman Kennke). Write a short sentence or a word in each node, make connection to next node and keep on writing. Play with the structure and new meaning will arise. Download short video (5 Mb) in ogg theora codec of FWP ‘Poštovani konj’ (‘Respected Horse’). Subscribe to comments with RSS or TrackBack to 'Semantics and Free Web Poetry'. izgleda ful zanimljivo. probat cu jedan dan tu shemu….